Flexible cubic boron nitride (CBN) grit hones are ideal for restoring surface integrity of machined superalloys. By its very nature, high-nickel, iron or cobalt alloy steels including Monel, Inconel, Incoloy, Invar, Rene and Hasteloy are some of the most difficult materials to machine. Because these superalloys are designed to deliver high strength at extremely high temperatures in components often found in “hot” sections of engines and turbines, the stresses and heat generated during machining are considerable. In this process, the edge of the cutting tool is exposed to considerable mechanical stress, strain and heat. High compressive and shearing forces attack this edge, increasing temperatures such that the cutting tools can begin to lose hardness. This can produce a “gummy” machining behavior and also cause work hardening. 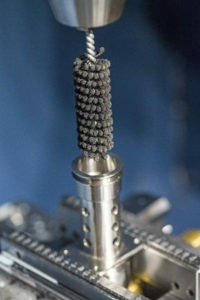 According to Janos Garaczi, president of Delta Machine Company, LLC., a company that specializes in machining complex, tight tolerance parts out of titanium, nickel alloys, stainless steel, aluminum, plastics and other exotic alloys, this is caused when chips do not break away cleanly from the workpiece. Instead, the material is just ‘pushed’ to one side. “It can be really difficult to turn or mill this type of material because it doesn’t produce a clear shearing action. Instead it just kind of pushes the material to the side,” explains Garaczi. “Gummy” machining is also the cause of heavy burrs in drilled holes or grooves. “The burrs are one of the biggest problems,” adds Garaczi. “Even during ‘grooving,’ if you cut the material from one side, it just pushes the burr to the edge; and if you approach it from the other side, it just pushes it back. It doesn’t want to break off the material cleanly. 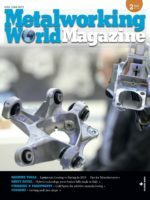 As soon as the tool gets a bit dull it gets a lot worse so sharp tools with the right geometry are key.” The general poor machinability ultimately compromises surface integrity of the parts, says Garaczi, which is problematic given that is one of the primary causes of failure of these types of components. Given the critical nature of the applications in which these components are utilized, most machined superalloy parts must therefore undergo a surface finishing operation to remove work-hardened layers and any heavy burrs. Doing so has additional benefits, including reducing the risk of oxidation and stress corrosion cracking (SCC). Although this has traditionally been achieved through an expensive, messy and time-consuming grinding process, new flexible hones are simplifying the task by incorporating one of the toughest, hardest materials on the planet – Cubic Boron Nitride (CBN). CBN combines the highest hardness with excellent toughness to provide the optimum surface finish. Flexible hones made of this type of material can be mounted on CNC equipment for automated operations or used in the field with handheld power tools to wear away work-hardened surfaces without inducing additional thermal distortion. High-nickel alloy steels are prized within these markets because of the excellent resistance to corrosion and heat with strength, toughness, metallurgical stability, and weldability. These superalloys are a great choice for applications that require chemical resistance and strength at elevated characteristics. Their material properties include low expansion at severe temperatures and creep resistance under high stress conditions. As such, superalloys are widely used as material for the hottest parts of complex equipment including nuclear power components, high-performance automotive parts and jet engine turbines. Nickel, iron and cobalt alloys are also used broadly for aerospace components, medical devices, petrochemical and refining applications and thermal processing. According to Garaczi, with the right cutting tools milling nickel alloys and stainless steels is still limited as to the surface finish that can be achieved to at best 32 Ra. With turning, 16 Ra is possible, but most of the time it requires a grinding or polishing step. “Grinding is a very common process in these cases, but it is very time consuming and very expensive to have to grind a part. In some cases, it could take longer than the initial machining.” As a result, Garaczi says that Delta Machine often sends parts out for grinding or polishing, opting to not perform this type of operation in house.